Owning a fish finder makes doing so many things that much easier. The gadget that utilizes sonar technology similar to radar developed mainly for and used in marine combat, has several applications outside of warfare. Fish finders can be used for diving, kayak fishing, bay fishing, ice fishing, angling, reef fishing, bridge fishing, shore fishing, identifying objects that are submerged in the water, and countless other purposes. Unfortunately, it is because of this that fish finders have to be such complex machines. While the basic principles of how they function are relatively simple, getting to know how to install, setup, operate, and master using one is a totally different story. That’s all after finding the best fish finder for you, of course. 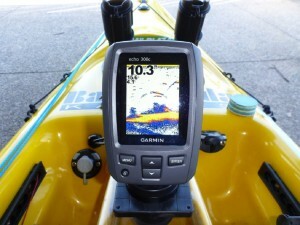 It can be complicated using a fish finder, especially in your early stages of owning one. One of the more difficult tasks to perform as a beginner fish finder owner is knowing how to properly setup and mount a fish finder. Two things on a fish finder need to be mount; the display and the transducer. The display is what shows the user the readings that transducer receives, meanwhile, the transducer is the part of a fish finder that is underwater and emits and receives sonar waves. Most fish finders displays are relatively to set up. The more difficult, and much more labor intensive, task is installing the fish finder’s transducer. A fish finder’s display mount is also called a binnacle mount. To set up a fish finder’s display screen, all you need are the materials that should come in any fish finder’s original packaging, a drill, some screws, and a place you can put your fish finder. This is standard for most fish finder displays, and is a rather quick procedure. You’ll need a nice flat, even, and sturdy area to mount your display. Next, you need to mark where your display will go, along with all the holes for where you plan on drilling. This should be pretty easy. Next you just need to attach the mount to the fish finder. Most modern fish finders have a sort of ‘quick release’ mount. All this is a ‘snap and go’ sort of contraption that allows you to take the display out once the base is drilled in. These types of fish finders are great for mobility, and can often be purchased for aftermarket modification. If you don’t have a quick release display mount, then it’s important to remember that the display will be permanently staying wherever you chose to place it – it needs to be located in an accessible, flat, area where you can both reach and see it. Almost every fish finder will come with an installation guide, and/or a manual that proves itself useful during the setup and installation stages. If your fish finder doesn’t happen to come with either of these, or you just need more clarity, you can try watching the video guide below. After you have your fish finder display screen permanently mounted, you can move on to mounting the fish finder’s transducer. The problem with such a useful tool is that there are seemingly endless variations, each built to work best in slightly different scenarios. Because there are so many types of fish finder mounts, it’s not as straightforward as just sticking the transducer on your vessel. Some fish finders require holes to be drilled, while others need a specific type of material in order to be utilized. Variety is good, but it can cause a little bit of confusion. 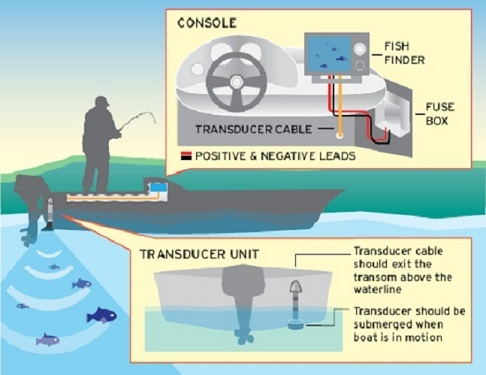 The most common type of fish finder transducer type is the transom mount transducer. The majority of fish finders available for purchase now will come with a transom mount fish finder, simply because these are simple and relatively easier to produce. Transom mounts are made of plastic, or other easily mass produced materials, so they are increasing in popularity. 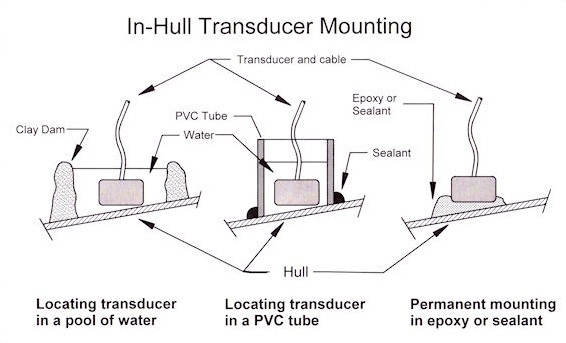 Through hull transducers are more often utilized in sailing boats or large vessels. Finally are the transducers that require the least amount of work and modification to your vessel – in hull transducers. In hull transducers are also commonly referred to as puck transducers because of their shape. After you install the binnacle mount, you need to run the power cables to the approximate area where the transducer will be located. If the original power cables are too long or short, you will need to modify them accordingly. Instead of cutting it shorter, you should coil the cable around and use cable ties to attach it to your vessel. This will simplify the process, but when you put the cable coil on the vessel, make sure it doesn’t create any additional problems – like drag or interference, and does not become an obstacle you are constantly tripping over. With all these types of transducers, it’s a little hard to focus on one, but with proper instruction and necessary materials you should have your fish finder installed in no time. 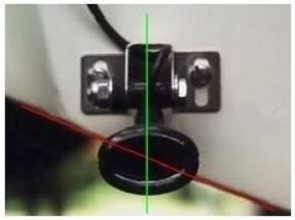 The first type of fish finder that you will be told how to install are the very common and cheaper to manufacture, transom mount transducer. These transducers are slighter lower in quality than the other fish finder mounting options, but they are very versatile, and because of this they are great for almost every use. These mounts are typically made to stick out past the hull, mounted on the transom – hence the name ‘transom mount transducers’. Transom mount transducers work in almost situation, but it’s generally advised not to use them for water vessels over 30 feet. 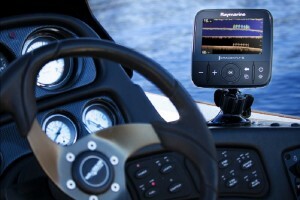 Transom mount transducers can move within 13 degrees, from three degrees to 16 degrees. You need to angle it slightly inward, towards the water. A transom mount transducer shouldn’t be used on vehicles that move at exceptionally high speeds, once again, due to the drag they create and the lower quality of construction in these models. If you followed these instructions, you should have a display set up, a cable somewhere close to your transducer and a drill in order to place your transom mount in place. Next, you need to attach the transom mount to the transom. This step is fairly easy, but it is one of the most critical parts. The transom mount should be centered, but not too close to any moving parts that may cause any disruptions in the sonar waves. If you get any turbulence from unclear, brackish, bubbly water, or choppy waters, then you may need to reconsider the placement. If you place your transducer too close to the propeller, water may be disrupting your signals, and you will receive less than optimal images when you are finished with your setup. After you have the entire setup finished, check your wiring. Once you are confident that your wiring is correct then you need to do a couple of test runs. Just get in the water, and do a couple of loops. Much better at giving accurate results at higher speeds are through hull transducers. These types of transducers are also generally much sturdier than transom mount transducers and will likely hold more safely throughout their lifetimes. Fish finders that utilize through hull transducers are usually specifically tailored for this, and these transducers generally have more range and better performance in general. Through hull transducers are usually the strongest type of transducer, and have the longest range. Because of this, they are generally quite a bit more expensive, but if you are dedicated the cost is well worth it. Before you even start installing a transducer, you need to hook it up temporarily, and then just test to see if it works. Make sure it turns on, and make sure that it isn’t dysfunctional from the beginning. 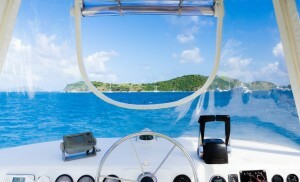 The best position for these types of transducers should be as close as the centerline of the boat as possible. Keep all other protrusions at least 12 inches away from the transducer. Protrusions such as rivet lines or strakes can lower the quality of your results when you finally have the fish finder set up. The transducer should be as flat as possible, and sometimes hulls are naturally angled. The angle of deadriseis the flat point of your boat, and if you don’t have a vessel that stays true to this, then use a leveling block. If the surface that you plan to drill your transducer to is off of the deadrise angle over 8 degrees, then a leveling block will keep the transducer flat. If you decide to craft your own leveling block, make sure it is even and accurate. Once you decide where to place the through hull transducer, then you need to finalize your decision with a pilot hole. Make sure your pilot hole is deburred, and large enough for your transducer cables to fit through. You should already have your cables approximately setup, so once again, it is a good idea to test your transducer. Put the wires through the pilot hole, and check if your transducer is in order once again. Next, use a sealant to put your through hull transducer flat on either your vessel or on the leveling block. Make sure to fill the pilot hole, the leveling blocks, and spread the sealant evenly under the transducer. Finally, screw the nut onto the threaded stem with appropriate pressure. In hull transducers are the easiest types of transducers to install. Holes don’t need to be drilled to place in hull transducers. These transducers are very specific however, and require the hull to be a material that sonar waves can penetrate. Because they ‘shoot’ sonar waves through hull, they are also called shoot-through transducers. These transducers create literally 0% extra drag, because they aren’t even placed on the bottom of the vessel. Unfortunately, however, they are generally not as powerful as through hull transducers because the hull may absorb some of the sonar waves. These are really easy to install. Once again, make sure your fish finder works well with this transducer. Once you’re certain that your transducer is in good shape, you can move well. First you need to make sure that the hull is made of fiberglass. Even more restricting, the fiberglass can’t have any cardboard, wooden planks in between or under it, or any other things that may obstruct the signal. Finding the spot for a shoot-through transducer is probably the hardest part of installing one. Next, use your choice of adhesive sealant. Most sealants take 48 hours to dry, and three days to cure. Your sealant won’t likely give up its hold, so make sure you’re certain that the position that you place it in is optimal. Put the sealant under your transducer in a thin and even coat. Place your coated transducer where you plan to have it with firm and constant pressure. Wiggle the transducer very slightly to release any air pockets. Put something heavy on top of it, and don’t touch it for at least two days, optimally three. Run your wires to the transducer once it’s stuck. Once you have your transducer in place then just quickly test it. Look specifically for extreme or constant amounts of noise, spots on your fish finder’s display, or other errors in general. If you catch any of these problems early enough, you may be able to fix it, though it is generally a good idea to make sure everything works before you mount these transducers. Most of these transducers are permanent or very difficult to remove and replace, especially if you have to do it constantly. Once you get it in working order, however, then you can afford to celebrate. The daunting task of installing a transducer may seem very complicated at first glance, but once you have your materials and resources, the job can usually be completed within one hour.